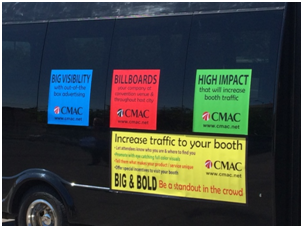 CMAC introduced shuttle sponsorship advertising opportunities in 1982 to compliment our expanding transportation services. 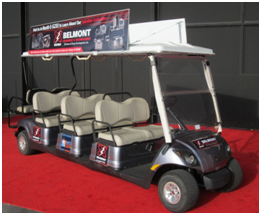 Each show is a unique entity with sponsorship opportunities tailored to event transportation specifics. 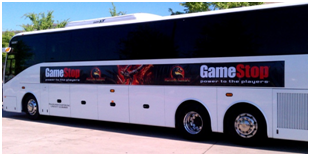 FULL BUS WRAPS - The ultimate high impact way to promote your company. 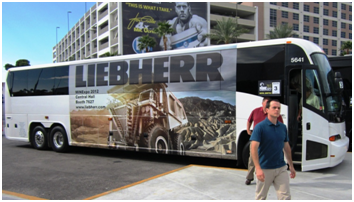 These buses are literally huge traveling billboards. 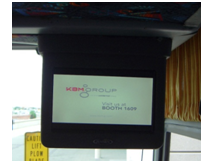 KING BUS WRAPS - Abbreviated wrap between the wheel wells.They provide extreme visibility from both sides of the bus. COACH SIDE RIBBONS - These 2'h ribbon signs belt the side of the bus below the windows. 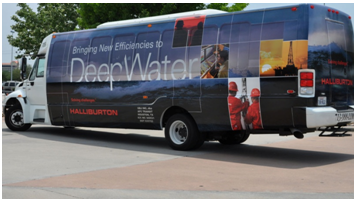 Available in 30', 22.5', 15' and 7.5' lengths (printed vinyl also available in 24' and 36'). 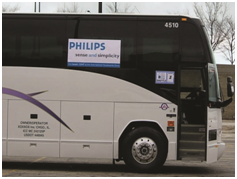 Effectively brand the bus with your promotional message on the entry side or both sides of the buses. 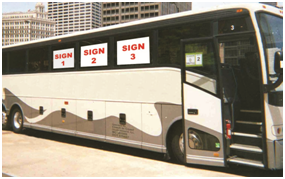 COACH WINDOW SIGNS - 4'w X 2'h signs on 1 or multiple widows on entry only or both sides. 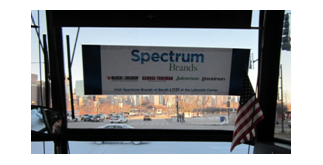 MINI-BUS WINDOW AND SIDE BANNERS - Triple 2' sq. 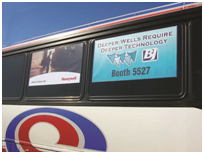 windows alone or with a 5'w x 2'h side banner - on 1 or both sides. 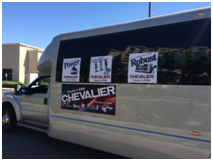 LIMOUSINE SIDE BANNERS - Brand your vehicle for an exhibitor for VIP service, special moves, executive transport. 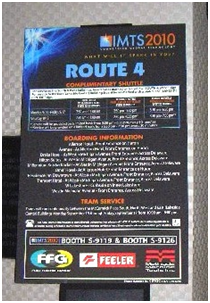 TRAM SHUTTLE - Multiple 8 passenger tram carts conveniently move show attendees between halls at select big campus venues. 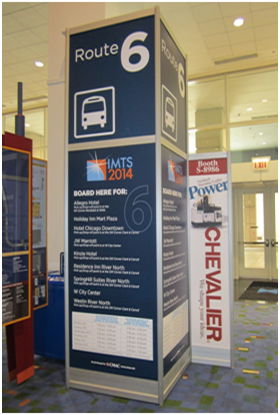 Continuously looping people movers provide extreme visibility with bold signage. 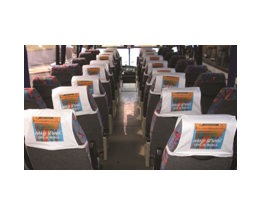 HEADREST COVERS - 20 rear facing covers per bus with crisp white linen covers on aisle seats with same 7" sq. color ad. 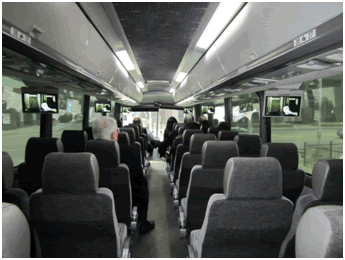 12 per bus on mini-buses. 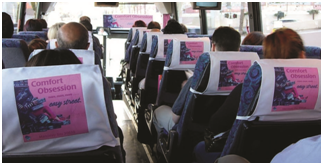 INTERIOR VISOR SIGNS - 40"W X 12"H full color placard displayed over the right mega windshield facing all seated and exiting passengers. 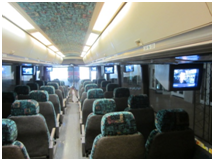 Both coach and mini-buses. 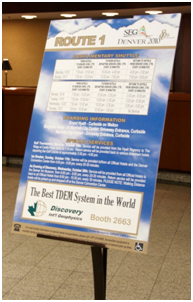 VIDEO PRESENTATIONS - Individual presentations, or part of a multiple exhibitor loop are possible for a portion of the fleet. .
HOTEL LOBBY SCHEDULE SIGNS - 19"W X 6"H color ads on lobby signs placed at all official show hotels. 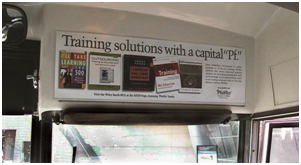 An ideal hot spot for ad placement. Catch all attendees on both arrival and departure. 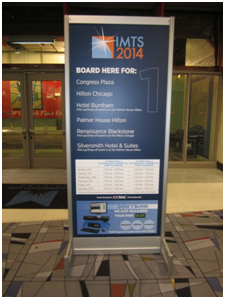 A Variety of signs and ad sizes to fit the meeting center requirements. We offer a truly turnkey experience. Sponsor supplies simple digital camera ready artwork at least 6 weeks pre-show and we do all the rest. 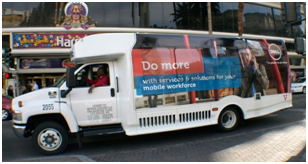 We provide the ad space, full production, installation, on-site management, insurance, removal and disposal. 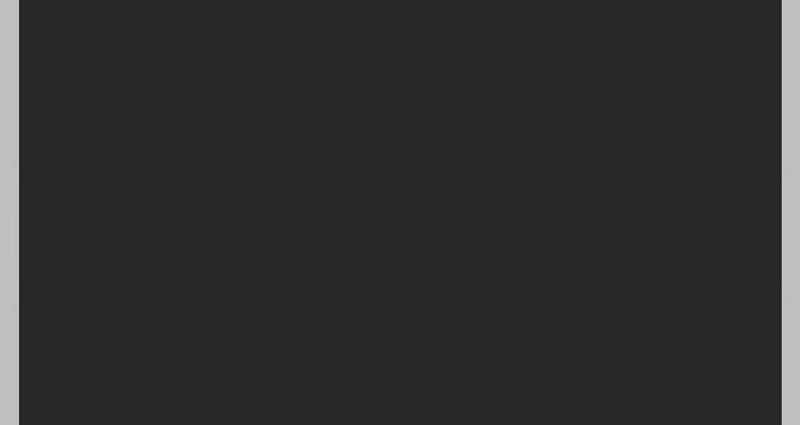 Additional items are available. Contact Bob Kaplan at 401-244-5219 or bobk@cmac.net.